→SEO is EASY but you are making it HARD! Here is what to do instead! Trust me SEO is easy! No. Search Engine Optimization is hard. The real thing is “SEO is easy” but you are making it hard. You are the reason your SEO is difficult. Just give me a few minutes to explain. I will also show you how to start ranking and celebrating search traffic. Very quickly, the best source of traffic I have had is search engine. I have experimented with Email list traffic, social media traffic, referral traffic, etc. That’s because visitors from Search Engines are folks looking for the exact same thing you have on that page. Maybe an eCommerce page, problem solving blog post or some page promoting something. They run a keyword on Google and are shown your entry as most appropriate and intent-fulfilling. Then they click the link and you grab their attention with your overall welcoming, eye candy design, straight-to-the-point intro, etc. And they want to spend more time on the site because this is what they are looking for. Then they click to order. Yes it’s the perfect item they want. They are pulled to your web page by the presence of that same thing they want. So don’t worry. They won’t quickly click away. They found it. That’s different from someone who found your entry on social media or your email in his mailbox. He wants to like ok let me see more about this stuff. He just feels to get something good. Not excatly anything he was looking for. See why I’m of the opinion that SEO traffic is the soft spot? But Why is SEO traffic difficult? What did you win, boy? ‘I the football match. My friend and I were just two of us and I scored the goal’. Sounds interesting. He has just become the hero. But. He didn’t choose to compete with Ronaldinho, or some big football names you can think of. He chose someone of his level. With a little effort, he came out victorious. That’s like the same thing in SEO. It’s difficult because you have chosen to fight the big guys. You want to rank for tough keywords. See, it’s not going to be chocolate to kick those guys off that position. You’ve got to really think before getting into the competition game. So how do I make it easy here? Like my son, don’t fight against the big guys. Don’t try to compete with competitors who are tougher than you. If you have what it takes, then it shouldn’t be hard. Otherwise, if you find it difficult to rank on position 1 of page 1 for the ‘SEO’ keyword, it means your competitors are stronger. You’ll find out it’s going to be easier. The weaker the competition, the more your chances to rank. Look at the second (long tail) example above. We went from ‘SEO’ to ‘SEO Companies in dallas tx’ and according to Ubersuggest of Neil Patel, this keyword is easy to rank for. There is 100% chance you can rank in the top 20. At this point, I won’t be competing with moz, wikipedia, Google and those other tough guys. The traffic may drop but I’ll be getting supper targeted readers. Some SEO marketers don’t even know what’s happening in the industry. I think they are still on holidays. Google updates are announced here and there. Some minor updates even go unnoticed. But this is happening regularly. And each time there is an algorithm update, there are changes in ranking. Many of us are losing ranking positions to competitors simply because we do not update. Once there are changes, we’ve got to follow the direction of change. But if you are stagnant, your rankings will drop and traffic will vanish. Most often, we have ranking changes not as a result of any algo change. Your competitors might have been fighting stronger. You just find out you’ve moved from page 1 to page 2. But if you do not monitor your position, you will never know. I recommend you use backlink and rank position checkers. Many of the tools out there will help you with this. SEMrush is the king of SEO tools. Signup to SEO news sites and be alerted each time there is an update. Another cool idea is to use Google Alerts. The worst piece of advice I ever had was that blogging is hard. And my humble adviser told me to stay away from the activity. This actually was to plant a seed of discouragement and false believe in me. But I gave this a deaf ear. That’s why I enjoy blogging. The freedom and the money, the connections and knowledge, etc. You can count the advantages. SEO firms, experts and consultants have told marketers that SEO is hard. This are lies in broad day light. Your mind has to be reprogrammed. You have believed the wrong thing. SEO is easy and you’ve got to have this stuck at the back of your mind to continue. How do I quit this stigma? Ok now we’ve dealt with the point of you thinking SEO is hard. Let me add some quick points to help you rank on top and pull more natural traffic. Earlier today, I got an excellent report from my friends over at Einsteinmarketer.com. This is a well-thought SEO checklist for marketers at all levels. If you start using this checklist effectively, you are never going to write and publish an article that can’t rank. This is not a rank guarantee factor however, but it helps you create highly rankable content. Create content to meet the need of searchers. Optimize your articles for topics not just keywords. Of course you need to do your keyword research but get semantically relevant phrases and points in your content. Backlinks are still a strong ranking factor. But getting these links isn’t easy until you create linkable content. If you pour out value in your content, you will find links to it growing, sometimes without you asking for them. Avoid buying links from link sellers on micro job sites like Fiverr. You may want to work with well researched guest posting services or SEO firms instead. Alternatively, submit guest articles on related blogs. This is the easiest way to build relevant links from good DA blogs. This is one way to earn (not create) backlinks but it’s a shock many of us do not know about it. The more healthy relationships you have in your blogging career, they more links you attract from your ‘happy’ readers. They are my friends and I’d like to give them a lift. Ryan Biddulph said it in this post. If you are generous in giving out and promoting others, you point your touch light to the mirror. The mirror will certainly give back to you what gave it. It’s as simple as that. I like telling my audience about great resources I find online. Make it a rule of thumb not to publish your next articles without promoting a friend’s stuff. You are opening channels to receiving more. This is closely related to point #5 above but I want to set it aside because it’s another unique way to push your friends ahead. Rome was not built in a day. So I will end here for now. Watch out for more. I’ll highly appreciate you sharing and dropping a comment. Hi Enstine, great stuff here! I love the Ubersuggest tool and have been using it. I also did download that great checklist, thank you! It can be done but you do have to stay on the top of the latest Google changes like the ones that happened last month and be aware of what you can do to improve your site’s SEO. Or you could hire someone you trust too. Thanks for the tips here Enstine, you are rocking it here! Thanks for the quick comment and yes the checklist is a solid help. I do like it. It’s interesting to know that I’m not getting any traffic at all from that keyword though I’m ranked on position #1 on page #1. I will do some more digging and do a blog post about it. Thank you once again for a good resource article. I am Semrush user. I use most of your suggestions. Ah that’s good to hear. Thanks so much buddy. Blogging gets easier and easier and easier the more we focus on helping other bloggers and helping our readers. Link to bloggers. Promote bloggers. Be generous. Be patient. In time you will become successful and your search traffic will skyrocket if you stick to the basics over the long haul. You are genius in this and we learn a lot from you and your results. Thanks immensely for sharing this post. I do know that every Blogger wants his or her post to rank well in SEO. A blogger who wants massive traffic to his/her weblog must stick to those tips you proffered on the post. Thank you Kufre for the comment. Thanks for the comment bro. SEO is key to online success. I just saw your mail been a while I received one from you, and head straight here. It indeed a helpful guide and also removes the seo myths created by most seo company to force client to patronise them. Am currently taking a the tough guns/guys up with my 3months+ old website project and though it tough as you said, I believe with time I can over turn them as am already ranking second for some of the keywords just after the toughest of them all. Also, I want to ask is it recommended to have a question and answer website this age and if yes should the answer be made available for Guest or strictly members. If logged in members, any negative effect on SEO? Yes bro I haven’t mailed for about a month today. It’s good to face competition and be ready to put up a corresponding fighting spirit. I will take a look at your forum site. Of course you can still succeed in the industry. If you create a niche QnA site, you can really succeed. Logged in members answer on quora but that doesn’t affect SEO. The point is, anyone should view the question and answers, including search engines. But to interact, you need to login. Your SEO won’t be affected. I indeed appreciate your feedback. It’s not niche focus but geographically focused which is my country, Nigeria. I understand the likes of Quora already pushing across the world and made their Q&A platform open (means questions and Answer accessible to members and non-members) and only need to join when you need to contribute. But, I want to do something a bit different as I don’t intend to compete with Quora and co. Thus, I made it only display questions and hide answer from non-login users (one of the reasons is that am looking at a unique platform to create a daily help Q&A forum in my country where there will be dedicated hands to research and respond to members questions individually and specifically and where different views could be aired by members in answering other members questions without been spoiled by link hunters as likes of Quora are gradually becoming). I do not pursue after huge userbase either but want to stay at the top of my SEO pull for it. Presently it gets about an average of 2 new members signup daily which made it have grown over 200 members in just 3months plus without paid ads. And my webmaster report shows almost 100% growth over the previous month at the end of each month. Thinking, I may stick with what it is for now while I follow how its SEO picks with time against the big guns/guys and would then decide if need be in future to release answers to non-members or not. But you may not have Search engine friendliness ans spiders won’t be able to crawl the answers, which is the core of the project. The stronger the competition, the more the fight. The weaker the competition, the easier it is. Your post is informative, and I agree with your points, especially the idea of stretching your keywords to make it less competitive. I that strategy most often and it works incredibly. In fact, a recent article I published is one of my guest posts that originally appeared on my hosts’ website. However, I decided to republish the article on my blog because it generated a considerable amount of traction. 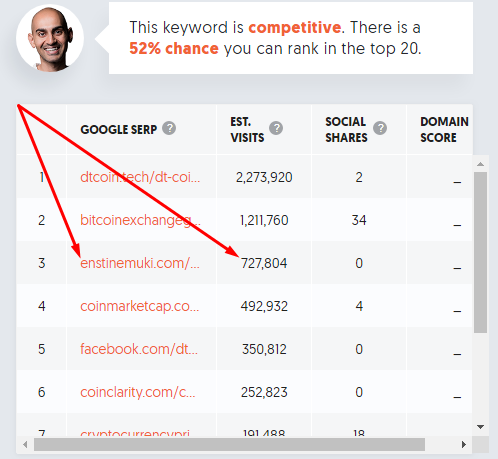 So, what I did before publishing was to stretch the keyword and add up more LSI keywords. Those were the only editing I performed on the post. Then I published it with a link back to the original source. Guess what happened yesterday when I searched for a related keyword which I didn’t even know was included on the post? My republished post appeared at the number 4 position on Google page one. I couldn’t believe it because I syndicated the same article to a publication on Medium. The point, although many make it seems hard, SEO isn’t difficult. You only have to learn to tweak your content correctly. You tips are remarkable. Good job! I thought that duplicate and mostly duplicate content always ends up in Google’s supplementary index. Nice to see I was wrong on this one, as it open up quite a few possibilities for me. Wow that’s a great case study. SEO isn’t difficult if you get tweak properly and don’t fight the big guys. I’ve found that ubersuggest isn’t very accurate but it’s still a great tool. Love the point about linking out. A lot of people don’t realise that by linking out to relevant articles, you give Google clues as to what your post is about and the quality too. It is an interesting article and brilliantly covered the minute details, which typically missed even by experienced SEO masters. i have tested relatiotion building with fellow blogger. that work great. thank you so much remind me again. Hi, This article is really awesome. Before reading this article I thought that SEO is hard. Now I got an idea. Thanks for sharing good information about SEO, I need your suggestion i lost my ranking last 15 days i did not know why every thing is ok in my website and also check my google webmaster its show ok, Please suggest me how i can find the reason to lost ranking my website. There is been a recent update by Google and many people are losing positions in SERPs. You need an SEO tool to analyse your site and improve on your content.